Oil investors got the most bullish news of the year on Wednesday June 29—US oil production dropped 145,000 barrels a day (bopd) last week. The stocks of producers went up, but the senior frack sand suppliers—US Silica, Emerge Energy and Hi-Crush—soared; especially US Silica. They were the first of the Big 3 to report Q2 earnings, and the Market liked what they heard—the stock was up 15% on 3-4 times normal volume. 1. Overall demand for frack sand is actually steadier than the Market believed; it’s not what it was at the peak of late Q3 2014, but it’s not as bad as had been priced in. 2. Demand for fine mesh products in particular are increasing. 3. Pricing appears to have found a bottom as smaller players have stopped the crazy discounts they were offering earlier in the year. 4. Legacy transport contracts are one of the big reasons that their financials look bad; they ordered many new rail cars, and are now paying $550 per rail car per month to be stored. 5. They are still on the lookout for acquisitions. That keeps bringing me back to Select Sands (SNS-TSXv; CLICF-PINK). They have a fine mesh deposit in Arkansas—that is 1000 miles closer to the huge Texan demand in the Permian and Eagle Ford areas than the existing Wisconsin mines. US Silica said their fine,100 mesh deposit in Oklahoma (the smaller the number, the coarser the mesh—20 is the coarsest, 100 is the finest) called Mill Creek is getting HUGE oil and gas demand, and they are almost at full allocation on just two customers. The Market wants more fine mesh product. They want lower cost logistics (i.e. transportation costs). Select Sands has an asset in the proven St. Peters formation (which is the same one that hosts the big Wisconsin mines), that’s much closer to major markets, has no legacy transportation cost issues and is exactly the fine mesh product the Market wants. They’re a perfect take-out target. But CEO Rasool Mohammad isn’t waiting around for that. With pre-feasibility study in hand, along with production permits, he is moving towards either producing the sand himself or initially having someone else contract-mine it and give Select Sands a per-ton royalty. He says that shows demand for their fine mesh product is increasing. RBC Securities agrees. In a June 8 note, they said fine mesh was taking market share and they expect it to keep that market share as sand volumes increase in late 2015. Why is this? Companies realized that while transporting the coarse sand, and during the frack down the well, the coarse sand is being worn down to become a finer sand. In other words, the coarse sand had become fine-mesh sand by the time that it actually reached the fracture location. So rather than use the more expensive coarse sand in a frac fluid, producers have turned to using finer mesh sand and slick water which is a less expensive combination. Lower costs=improves well economics. There is other evidence of this fine mesh trend found in the Seeking Alpha conference call transcripts from the first quarter of 2015. Fairmont Santrol (FMSA) Q1 2015 call – “certainly we are seeing an evolution of frac treatments to include more 40-70 and 100 mesh. There are a number of reasons why that is and it’s mainly around costs…..40-70 and 100 mesh is the prop of choice when you do slick water fracs which also provides the cost savings as it relates to water and other additives. While sand volumes year-to-date are down 15%, US Silica also said the trend to use more sand—or “proppant” as the industry calls it (as sand “props” open the cracks the pressure opens up)—per well is still happening. This is a multi-year trend. With each passing year the shale industry learns better ways to drill and complete (frack) their wells. Over the past year it has become very clear that the industry has concluded that increasing the amount of frack sand per well improves profitability. The increase in the amount of sand most companies are using per well would explain why energy industry intel firm PacWest expects total demand for frack sand will not decline significantly in 2015 despite the dizzying decrease in the number of wells being drilled. I think there is good reason to believe that the demand for frack sand has likely bottomed in the second quarter of 2015 and will start to increase from here. First, there thousands of wells that have been drilled but not completed across North America—the “fracklog”. Since these shale wells produce so much of their oil in the first 18 months, companies have been holding off completing the wells until oil prices rise. Assuming we get a bit of an improvement in the price of oil in the second half as U.S. production heads into decline there is going to be an uptick in fracking to get these drilled but uncompleted wells on-line. Second, a recent development since the oil price collapse has been companies choosing to “re-frack” wells. This means the companies are re-entering older horizontal wells that were fracked with earlier, less advanced techniques and fracking them again with today’s improved best practices. Re-fracking provides a production boost without having to incur the cost of drilling new wells which is appealing in the current difficult environment. The Saudi decision to not only not cut production to support the price of oil but to actually increase production has forced the entire industry to redouble its efforts to lower the price of oil needed to make this shale production profitable. An increase in the amount of sand has helped increase production rates and moving to finer-mesh has helped reduce costs. AND–The past two weeks have actually seen the number of drilling rigs in action increase, albeit slightly. 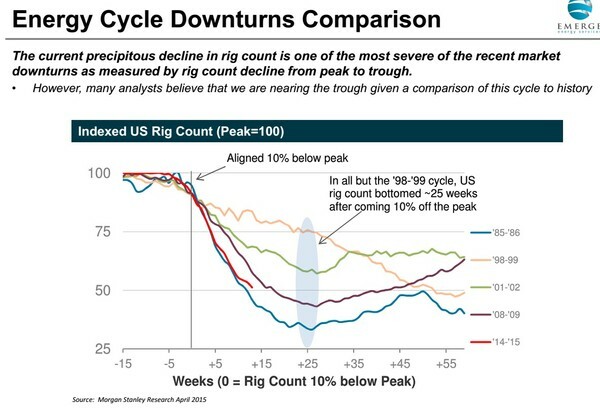 And as the chart below from Emerge Energy Services shows, we should be at that point in the cycle where the rig count levels off. Frack sand stocks are giving back almost none of the big gains from yesterday. With the rig count bottoming, oil the inventory of drilled but uncompleted wells waiting ready to be fracked and what I expect will be a second half oil price recovery now may be the time to be giving the frack sand suppliers a hard look. Like the oil producers, these companies have stock prices that have been beaten down which could allow for a big bounce back if the market does turn. And as the highly prospective junior in the bunch–with no baggage from expensive legacy transportation deals–Select Sands would be the one with the most leverage. Select Sands management has sponsored and reviewed this article. These are paid bulletins Oil and Gas Investments Bulletin .